Imagine yourself traveling through Spain, Morocco and Portugal. Now imagine doing this on a bus with 45 people, nearly all over 60. Covering three countries in 16 days can be challenging, even with a skilled bus driver and an experienced tour leader. 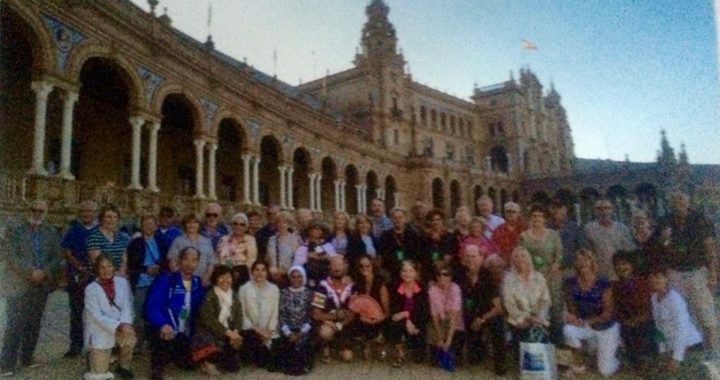 The trip can turn from challenging to fascinating with bus mates from all over the world. Not only are you experiencing the adventure of visiting places never seen before but of being literally elbow to elbow with strangers who for the 16-day trip will be your new best friends. It’s a study of personalities, all with their individual life stories that have brought them to the same place at the same time. For the most part, you will be close for only a short time, never to have your paths cross again. There’s the man who has been battling COPD for 11 years carrying around his portable oxygen tank. He’s accompanied by his former wife who, while she travels with him, will not consider remarriage. There’s the retired banker who once did business with Donald Trump and who says he refuses to vote for him for President. There’s the research scientist who was born in Iran and trained in the U.S. who has computed that, as a result of the 2008 stock market crash, she will have to work until she’s 85. And the woman from New Zealand who admits she’s fascinated with men and watches them all the time. Then there’s the Aussie who’s been writing a book about the history of his country for 30 years. And the tour guide of Welsh ancestry who speaks multiple languages, converted to Islam and lives in Tangier with his Moroccan wife. Among the travelers was also a nurse practitioner born in Mexico City who now lives and works in Miami with her Cuban husband and son. Also, the three women who are good friends from Australia traveling together abroad for the first time. And the German woman, a retired hair dresser, married to an American man retired from selling life insurance. Or the relatively young Australian couple — We did have more Aussies than any other nationality — who were logging in a six-week adventure while their school-aged children remained home in captivity. Then there’s the CFO born in Poland transplanted to Tennessee who is lucky enough to have snagged the only solo seat assignment allowing her to spread out over 2 seats over the entire trip on an otherwise jam-packed bus. And the caterer who is writing the trip off as a business expense as he collects new recipes. He’s traveling with his nearly 70-year-old spouse with apparent boundless energy who is a competitive dance skater. Thankfully, we also had onboard a “young” tech genius and ace photographer (another Aussie) who, with his spouse, traipsed around to places in the dark of night to get spectacular images to share while most of us collapsed with fatigue in our hotel rooms. Do you have a travel experience to share? Contact us to share your story and enrich us all. © Advantage-Plus Resources, Inc. & SuccessAfter60.com, 2015. All rights reserved.